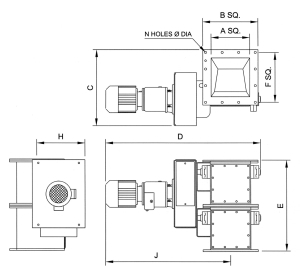 The inlet ports of the Bulkmatic Double Motorised Flap Valve are generously sized with steeper inlet angles than other valves available. This bigger opening allows better gravity flow with less bridging resulting in more efficient operation. The valves are supplied with ’'wear resistant’' chutes and flaps as standard. 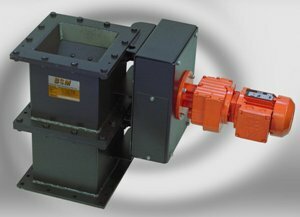 The Motorised flap valve uses a conventional geared motor to drive the cam mechanism. This allows the unit to open and close in a controlled sequence to ensure effective sealing. The closing phase is controlled by an independent spring for smooth running and positive flap sealing. Valve options include stainless steel construction, high temperature construction, rubberized flaps, stuffing box shaft seals or standard lipped seals. Single and Double Gravity Flaps are also available in all the standard sizes. Standard sizes include: 200, 250, 300, 400, 500 and 600. Other sizes manufactured on request.